Discussion in 'General RPG Discussion' started by LordArchibald, Apr 28, 2018. This is the first forum where I'm announcing the game I'm working on a PC classic RPG inspired by the games from the 90s. Basically, it's the kind of game I personally find missing nowadays. Light, fairy tale, epic, heroic and slightly humorous. One that does not take tons of hours to complete or require endless grind to progress. Something that caters to players like me who don't have 40 hours to beat one game but still like to play and have a sort of nostalgia for the way games were made in the old days. 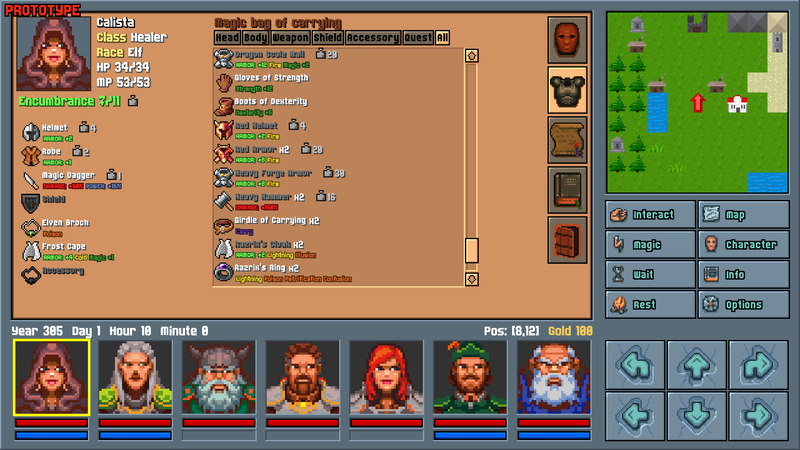 It was inspired by Dungeon Master, Eye of The Beholder 2, Might & Magic 3-5, Crystals of Arborea, GoldBox series. Storyline is a fairy tale, mythical heroic fantasy. You are the good guys on a quest (no moral choices ). The world is strongly non linear, with very few locked areas. You basically can go anywhere and do things in different order. It's more like world driven than story driven. The priority was to make the world feel alive and let you explore it as you wish. Probably it will be released somewhere next year (EDIT: Q1 2019). Nice, I can't wait to play this. I'm 100% sure that I've seen a thread around here about a game in the making that looked almost identical to this about 5 years+ ago. You sure you haven't posted about this before? Some don’t believe in Marx and Lenin but believe in ghosts and gods; they don’t believe in ideals but believe in sorcery; they don’t respect the people but do respect masters. Nice. Will the monster graphics still be improved to be as beautiful as the portraits? Reminds me of M&M World of Xeen, best of the M&M games. Looking good! You mean the resolution or the style? I wanted to keep the 3D view as it is now (16x16 pixel monsters), it adds to the mood in my opinion. I could bump those to 32x32 but it would be still super pixelated so... As for the style of the monsters I'm open to suggestions. Resolution, I'd say. 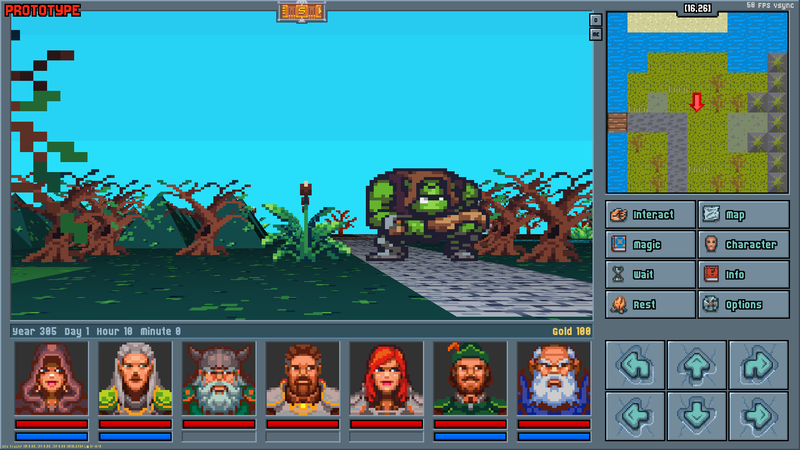 The pixels of the monsters and huts in the 3D view are much chunkier than the very nice pixel art of the character portraits, so it really clashes with each other. I knew I saw that pixel beholder in front of a polygonal mountain before! I'm actually pretty intrigued, this is exactly the kind of game no one makes any more, despite the retro rpg wave of the last years. Care to tell us a bit about technical stuff and how you plan to release it? 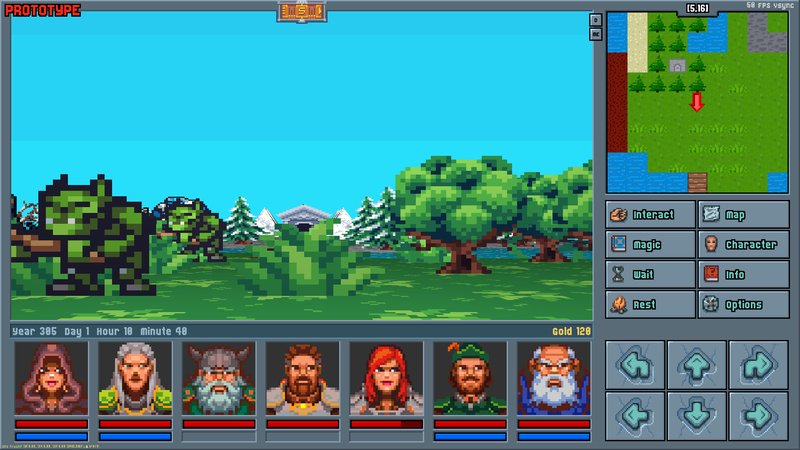 As with the older project, there are about 6 different pixel sizes going on in the UI, so it's not like the enemies add that much to the clash. Not to be a graphics whore but a lot of the charme of the early M&Ms were its wonderful, colorful and creative graphics. That super pixelated style doesn't do it for me at all. Other than that, this looks pretty much like early M&Ms, which is to say, pretty good. Looks charming like World of Xeen, but what's with those green and brown tetris pentaminos we are fighting? Or are those lego blocks? Do we create all seven party members, or are the last spots reserved for hirelings/NPC's? Indeed, the beholder (renamed: Floating Eye (renamed: Eye of Morgul)) looks quite iconic One of the reasons why I tend to prefer to stick to the current resolution. Exactly my thoughts, no one makes those games anymore. At a glance there is a lot of those, but when I check those closely I see no overworld (mostly dungeon crawlers) or it's isometric (which is noce and everything but it's not what I desire as a player) or somehow it does not give me the vibe of the ones I played in 90s. Dunno why almost no one make those... it's not like it's unreachabe technically nowadays or something. It will be released on PC, Steam, I will also try GoG. I have 2 games released on Steam already, so it will be done similarly, except there will be no Early Access (which makes no sense for traditional RPG). Most likely there will be closed Alpha and Beta before that. It has fairy low hardware requirements but require minimum resolution of 1360x768 (it was a nightmare to make it both look & feel as fixed size interface and support all/most modern resolutions without ugly stretching). All party members are created and are with the party from start to the end. seven is very unlucky number. Is it balanced around it or one would be able to complete it with 1 or 3? Unlucky? What do you mean? Well, it's balanced for 7 characters but I suppose one could try to play with 4 or something. 1 character definitely would be unbeatable, you need a party of heroes to survive. My goal when designing inventory system was to make it both fast & convenient to use and to provide interesting choices to the player. The party has a shared "Magic bag of carrying", all items goes there and it has unlimited capacity (so, basically there is no "backpack storage management" which I personally find tedious). All items go to the bottomless magic bag and all party members can access it. Each item has encumbrance which represents how cumbersome is to wear and use that item (for example a robe and a knife has far lower encumbrance than a battle axe and a full plate armor). Each character has maximum encumbrance based on profession, race, strength, etc (wizard having far less maximum encumbrance than a knight). Maximum encumbrance determines how many encumbrance points from equipped items a character can accumulate before hitting a penalty (there are two tiers of penalties for getting over maximum allowed encumbrance). In short, party can carry an unlimited number of items in their magic bag, but what they can use is restricted by encumbrance system. Each character has equipment slots (head, body, weapon, shield and 3x accessory). In addition you are allowed maximum 1 accessory per type (so no two capes or two girdles). It forces the player to make more meaningful decisions regarding accessories composition plus limiting it to 7 slots total per character makes it more manageable for a 7 party members party. There are no profession restrictions to items use (a wizard can, in theory, wear a full plate armor and a long sword) but since magic user classes have rather feeble maximum encumbrance they will in practice end with robes and other light stuff, unless you assign them some very rare items like Girdle of Carrying (which also uses a precious accessory slot, so it's still a trade off). I have seen two systems of combat initiative & member position in turn based RPGs. One simpler where party members attack based on initiative stat and some arbitrary member slot (like those the ones on the very right/left) get bonuses to defence and second where there is a complex initiative system with mini portraits being shown representing who will attack next. None was to my liking for this particular project. 1) Party members attack from center to flanks (based on portraits locations at the bottom). Which means the hero which is placed in the center (#4th portrait) attacks first, then those left/right to him/her (#3 and #5) and so on with the flanks (#1 and #7) going last. 2) Monsters tend to attack first the center slots (#3, #4, #5), so it's preferred to put there heavily armored knights, dwarves and so on. Also, as long as they are alive, they act as a sort of shield for low HP heroes who can be placed on the flanks (wizards, healers and other support characters). 3) Monsters act based on their initiative which differs from monster to monster. Typical monster has lower initiative that the central heroes slots but higher than the flank slots (with plenty of exceptions for faster/slower monsters). Usually, the party will have a chance to act with the central slot characters before the monster has a chance to attack (opportunity to kill with first strike without fear of retaliation, as long as the central heroes can kill the monster on their own with the first blow). Implications: The player trades safety for initiative when deciding on party members placement. While placing a wizard on the flank is the safest setup he will act very late in combat while his multi target magic abilities are the most useful when going early in combat. Similarly, decision on the armor vs damage for the central heroes is a decision about survivability of long fights vs early elimination of the enemy. I like this idea a lot. Position of characters ought to matter, even in a first person dungeon crawler. It might take some adjusting to, as I am familiar with having the party's lead characters in spots #1 and #2 in a formation like this. And intuitively, I might think of keeping weaker party members in the middle, as if they are being protected. But this approach will be interesting to see in practice. I'm looking forward to this project. I like the premise a lot, definitely looking forward to it. Would like to see how it fares with 32x32 monsters though. Will there be different sizes? I like the initiative system, but I think there should be some UI indication that the central 3 characters are your "front rank". Maybe rise the portraits up a bit? BTW, it synergies well with 7 characters in the party (so it's always clear who is in the very middle). By different sizes do you mean monsters that take up more than one grid at once? There is no "front rank" per se. The initiative order is like that: #4 #3 #5 #2 #6 #1 #7. Also monsters tent to target "the center" (and if the target character is dead they go and target the left or right) not necessarily #3 #4 #5 (plus, #4 has the highest chance for being targetted). So it's more fuzzy. Oh yes, one more thing, you are unable to change party members order during combat (also you can't change equipment during combat). Just to prevent tedious micro-optimization and system abuse. Also somewhat having World of Xeen vibes. Fingers crossed! Everything looks awesome, except the world graphics should be at least double or triple the current pixel number. Do you think you can create world graphics of a similar quality as the party and item graphics? This is quickly becoming one of the top two computer role-playing games I am most anticipating. More so than Bard's Tale IV. What's the other top two title?